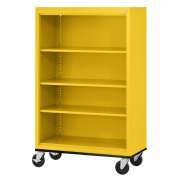 Hertz Furniture is proud to introduce a highly varied line of library bookcases. 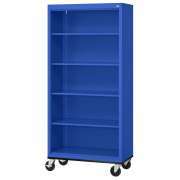 We have bookshelves to suit any library, from large universities to small private schools. Our great selection of steel, laminate and wood bookcases will meet all of your budgetary and spacial requirements. What&apos;s the best way to organize library books? Choose from single or double-faced library shelving in a variety of heights and styles to keep books organized. Combining wall-mounted and freestanding bookcases lets you make the most of your floor space, while our colorful Educational Edge library shelving adds a dash of cheer. What factors should I consider when choosing library bookshelves? The style of a bookcase can impact the feel of a room, but the configuration and design are important to consider as well. 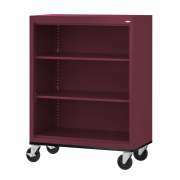 Mobile bookcases can be quite convenient when many volumes need to be moved around at once. Bringing an entire class into a library to work at the same time can cause a disruption to anyone else who is studying in the room. 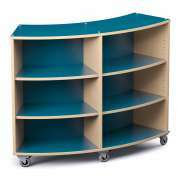 However, when a whole class is researching a topic together, mobile bookcases can be used to bring the library into the classroom so students will feel free to have open discussions and consultations without disrupting other people. If you have a fully-stocked book collection and you know what you will be using shelving for, it is important to make sure that the weight capacity of the units you are purchasing matches the books you need to house. Additionally, shelf depth should be considered as well. For large volumes such as reference books, large-print books and encyclopedias, extra-deep shelves might be required so the books won&apos;t stick out. Bookcases also come in many different heights. Lower bookshelves are great for children&apos;s libraries. Floor-to-ceiling models maximize storage space so you can fit as many books as possible in the room you have. Whichever heights you choose, there is also the matter of single- or double-faced shelving to be considered. Should I get single- or double-faced library shelving? Neat, attractive library shelves are essential to any school or public library. They ensure that your books stay in great condition, and offer a nice display space. No matter how large or small your library is, you&apos;ll find library shelving to suit your needs at Hertz Furniture. Most libraries will probably benefit from a combination of single- and double-faced shelving. Single faced shelving goes against a wall and if the bookcases have finished backs, they can even be used as room dividers. Freestanding double-faced bookcases enable you to create additional aisles or rows in the middle of the room. 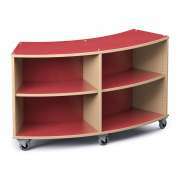 Lower double-faced units also work well as room dividers or childrens&apos; bookcases. What is the most affordable way to get library bookshelves? Double-faced shelves might be a bit pricey for institutions on a tight budget. However, there is a solution which creates a similar configuration. You can get significant savings by fastening single-faced bookcases back-to-back instead of purchasing double-faced units. This arrangement offers the same configuration as double-faced bookshelves with the added benefit of being able to separate the shelves if you decide that you want single-faced units in the future. If you really want double-faced shelving but just don&apos;t have room for it in the budget at present, you can call the Hertz Financing Department to arrange a personalized payment plan. How can I make bookcases look built in? Starter and adder units create a custom built-in look without the extra expense of a personalized design. Modular bookcases save space and money, enabling you to fit more shelves in the room that you have. You can order the perfect number of shelves for your study space for wall-to-wall books. An additional benefit of modular bookshelves is that you can always add more later. You can start off with one arrangement and simply attach more adder units as the book collection expands or your reconfigure the space. Russwood Library Furniture brings you the convenient option of modular shelving. Are steel or wooden bookcases better? Because books are very heavy, it is important to purchase bookshelves designed specifically for holding them. 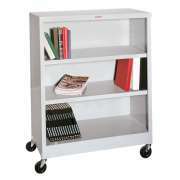 Hertz Furniture offers tough library shelving in both steel and solid wood. Datum library shelves are constructed from 22-gauge steel, which provides the toughness you need to support literature. Steel bookcases come in a wide selection of colors including vibrant and more muted tones. Colored steel bookshelves can be used to differentiate between various types of books so it is easier for patrons to find what they are looking for. Locating the history section from afar is much simpler when you know that is is housed in the yellow shelves. Without color coding, patrons will have to be within reading distance in order to determine if they have located the correct shelves. A variety of eye-catching hues will also make any space more inviting. Solid wood shelving has a classic stately appeal that is reminiscent of elegant and highly-prized book collections. Russwood library shelving is constructed from solid oak and real oak veneers. It has an extremely high book capacity. You can choose from a selection of appealing wood hues to coordinate with your other library furniture. Nothing beats the classic elegance of natural wood tones. For a more professional and sophisticated look, solid wood bookcases will get the job done right. The visual appeal of natural tones is matched only by the incredible strength of solid wood. If you love wood hues, but don&apos;t have room in your budget for real solid wood, you can achieve a similar visual effect with laminates or wood veneers. 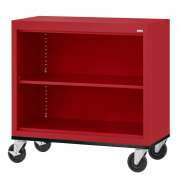 What kind of library shelving should I get for my office library? When you are outfitting a library for an office or professional institution, consider bookshelves from some of our stately office furniture collections. Elegant edge detailing and rich classy hues makes these shelves perfect for a more serious environment. They will also look great in an upscale school library. Adams traditional library walls from Norsons are a perfect combination of elegance and toughness. Attractive molding wraps around their top edges to create a built-in look when units are combined in a row. This custom appeal will lend a high-class look to any study area. We also have radius-edge shelving units which create a softer feel than harsh straight lines. Should I get special library shelving for the children&apos;s section? While most school library shelves are open, there are some instances in which fixed dividers are advantageous. In early-childhood libraries, fixed dividers help keep thin books in an upright position, and make it easier for little ones to remove and replace books. Dividers can also be helpful whenever a shelf is less than full and you don&apos;t want books to tip over, or when you want to divide books into small, clear sections. For a brighter, inviting reading space, look no further than Educational Edge library shelving. These strong and sturdy bookcases feature brightly-accented edges in a selection of hues. They are perfect for a children&apos;s section or even a contemporary adult library. They can also be coordinated with classroom colors for those who keep many books in the learning space. Inspire reading by displaying your books prominently on Hertz Furniture&apos;s attractive collection of library shelves. Our wide selection offers a number of styles, colors and configurations that can fit in with a variety of library furniture. At Hertz Furniture, we know that figuring out the perfect combination of library bookcases can be a complicated and daunting process, and that&apos;s why we are here to help you every step of the way. For personalized assistance from layout to selection to ordering and beyond, contact the Hertz Design Team to begin planning your dream library today.